The awards criteria was clearly defined and covered such areas as Values and Identity, Succession, Strategy and Overall Business Performance. Founded in 1982, the company has been family owned and family run since its inception. Over the last 3 years, the business has transitioned from 1st to 2nd generation leadership, where control of the business has been recently handed down to the second generation, identifying key areas within the business that needed to come online with core values, providing sustainability for future growth. The transition adopted a ‘top-down’ approach, where the three members of the 1st generation have moved into an ‘oversight’ role, allowing the younger Directors to take over the day-to-day running of the business as part of the new executive team. The launch of the new HQ and warehouse site in Watford, bears testimony to the way the various skill-sets of the Directors have been combined to achieve an award winning and nationally recognised operations base. Employing the latest, state-of-the-art technology from Austrian factory specialists Knapp, the new site boasts the very first, UK based FMD (Falsified Medicines Directive) compliant packing line in wholesale pharmacy delivery. The success of this new ‘family run’ strategy is very evident by the numerous customer testimonials and awards won during the last few years. The company strapline, ‘Independent Together’ sums up the customer service ethos of putting the independent pharmacy customer first, above and beyond anything else. This ‘family-ness’ has been used as a competitive advantage, particularly in a market where the bottom line makes all the difference and where price-wars are prevalent. The strategy drives loyalty and goodwill with all Sigma customers and is testament to why the business is still thriving 35 years after its inception. 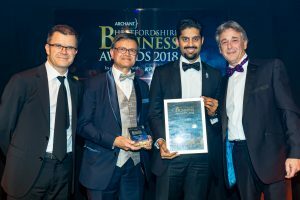 Sales and Marketing Director Rajiv Shah said: “Naturally, we’re pleased and greatly humbled to receive such an award in Hertfordshire. It sends out a clear message to all our customers that the quality and reliability of our service offering, depends wholly on the strength of our family, working together, to provide one of the best wholesale services to pharmacy in the UK”.